Equipped with good camera, this does not hang much. The resolution is good. Lately memory problem in installing apps can trouble and give you headaches. 1 Pricebaba user have written their experience with Micromax Canvas Fire 4. 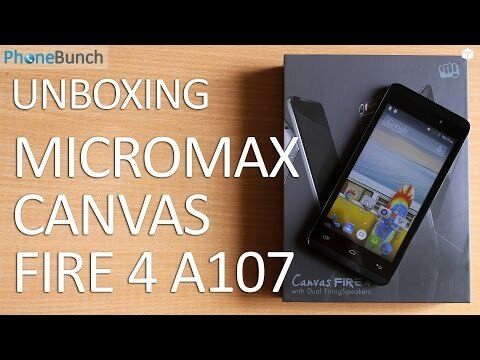 If you own Micromax Canvas Fire 4, please do leave your feedback too. Micromax Canvas Fire 4 is yet another entry level Android phone from Micromax. Based on the naming, it looks like it the successor of the Micromax Canvas Fire 2. Out of the box this phone runs on Android 5.0 Lollipop, which is great as (at the time of writing) many of the budget phones other than the Moto E 2nd Gen still come with Android Kitkat or older. Front of the device houses a 4.5 inch screen which is protected by Gorilla Glass 3. Only downside to the display is that it is a 480p display, while competitor devices sport at least a 720p display. Phone runs on a 1.3GHz Quad-core Mediatek processor and has 1GB of RAM. It may stutter on intensive multitasking or gaming. Camera on the Canvas Fire 4 is an 8MP unit which does not records 1080p. It comes with 8GB of Internal Storage of which only 5GB is made user available. But there is a micro SD slot for expansion of upto 32 GB. It has a huge 2000 mAh removable battery which is great, as the phone does not have a HD display and the users will get a good battery life out of the Fire 4.